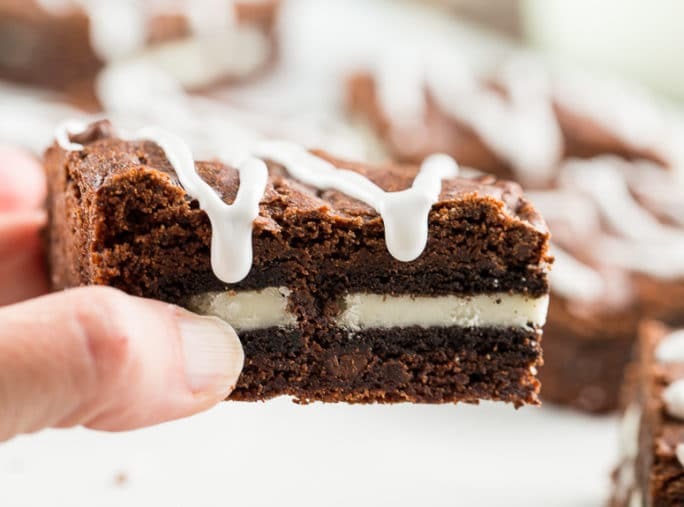 Fudgy Brownies stuffed with Oreo cookies and drizzled with white icing are an easy and fun treat. This is a recipe I’ve been wanting to make for ages and I had the perfect excuse to make them this past weekend. My daughter and I baked Oreo Brownies, Cookie Dough Brownies, M&M Cookies, and Banana Chocolate Chip Muffins for the Cancer Chase 5K which my son hosted to raise money for cancer research. Oreo cookies are much loved at out house. In fact I had to go to the store a second time to buy oreos for these brownies because the first ones disappeared before I could use them. And my family is under strict orders not to eat anything they didn’t buy or make without asking first. But I guess oreos are worth the risk of punishment. 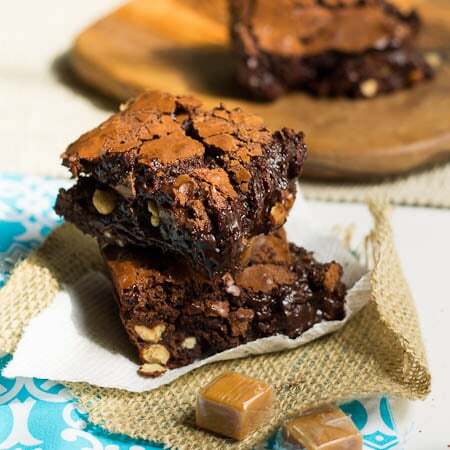 The cookies get somewhat soft inside the brownies and make the brownies a little chewy. I used Double Stuffed Oreos to really get as much of that wonderful cream flavor as possible. You really want to layer as many oreo cookies in the middle as you can. I used a 9X13-inch pan and although I had to break the oreos in half for the last row, I was able to use the whole package except for one lone cookie. Make sure you spread no more than half the batter in the bottom of the pan or you will not have enough left to cover the oreos and you ant them to be a hidden surprise. To decorate the tops, I just used a tube of white frosting that already had a decorating tip attached to it. It was super easy. In a heavy-bottomed saucepan over low heat, melt the butter. Add the sugar and stir the sugar into the butter with the pan over low heat for about 15 seconds to help dissolve the sugar. Remove from heat. In a large bowl, whisk together eggs, cocoa powder, salt, baking powder, and vanilla until smooth. Gradually (to not scramble the eggs) whisk butter/sugar mixture into egg mixture. Add flour and chocolate chips and stir just until the flour is incorporated. Pour half the batter into the prepared pan. Place oreos in rows on top of batter. Pour remaining batter over oreos and spread gently with a spatula. Bake for 35-40 minutes. Cool brownies for at least 20 minutes before cutting. 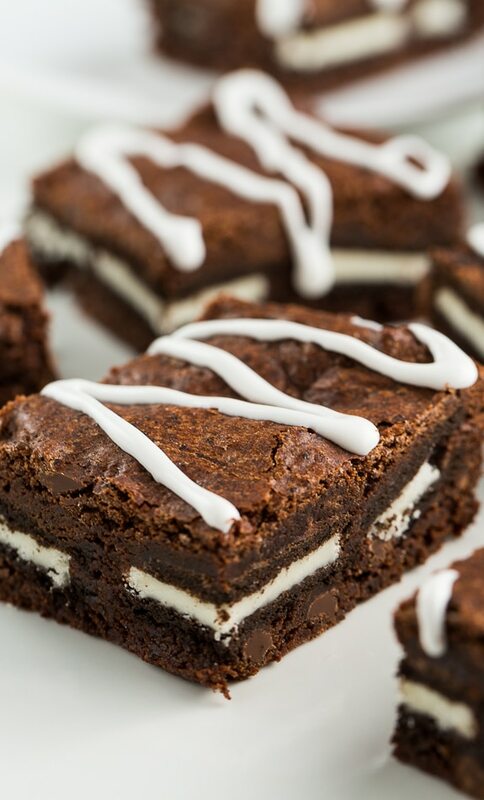 Drizzle white frosting on the brownies. Sharing with The Weekend Potluck. 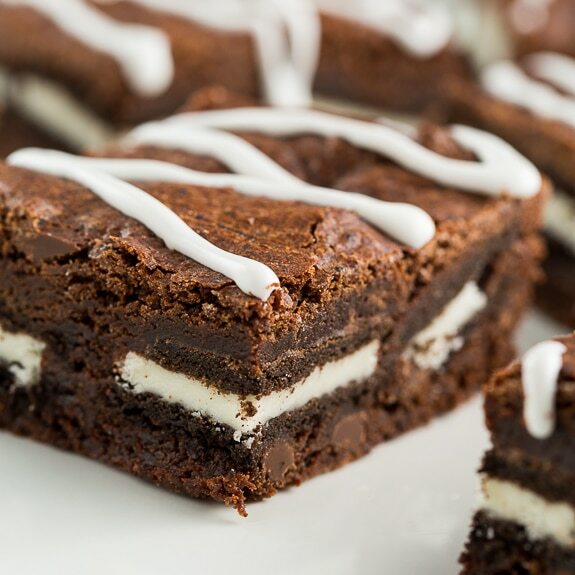 This entry was posted in Brownies and Bars, Desserts and tagged brownies, oreos. Bookmark the permalink. I’ve never tried making it without eggs. Ha! Ha! Too cute that your family performed a disappearing act with those Oreos. It sounds like you really baked up a storm for the charity event. I’m wondering which was the first to disappear. . .could it be these decadently delicious brownies? Oh my god I am just salivating here over the images Christin. These look incredible.. I seriously am lost for all words. These are absolutely perfect! I’m obsessed with oreo cookies. I’ve been dying to put them in my brownies and this just put that to the top of my baking list! Pinned! 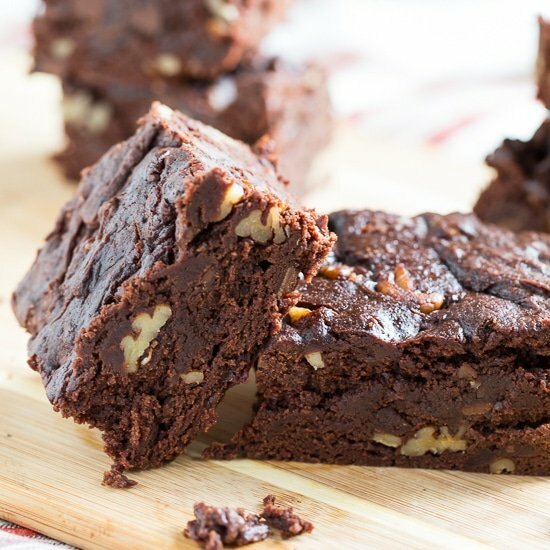 These are the ultimate decadent brownies! I love that you stuffed them with Double Stuf Oreos, those are my favorite! And the white frosting makes these so pretty! Good thing stuffed with a better thing.. or maybe better thing stuffed with a good thing.. one way or another these brownies are just great! Oh YEAH! I saw these on Instagram and just HAD to pop on over and check them out! Talk about my dream dessert! YUM. Yummmm. These brownies are making me drool. That Oreo cookie layer looks perfect! Thanks for the tips! I’m sure that you are very proud of your son. I love that he is doing so well and raising awareness. I also love that your daughter loves to make these delicious treats with you. 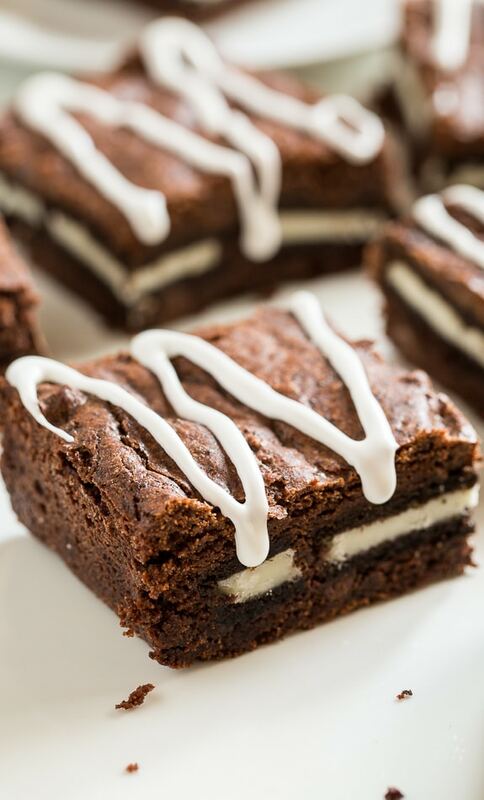 Brownies are better when they are stuffed with an oreo! I gained 5 lbs just reading this! These look delicious and I love the drizzle of frosting on top just takes them over the edge! Oreos having a tendency to disappear quickly in our house too. I love that you used the double stuffed oreos, the more filling the better! These brownies look like pure prefection! I’m pretty sure a pan of these brownies would be gone in 5 seconds in this house! These look incredible! Pinned! Wow these look absolutely amazing!! I am a huge fan of oreo’s too! They don’t last long in our house either! When I saw these just posted on Instagram you made my belly rumble with happiness. I am a huge Oreo fan (dangerous to be around them!) but stuffed in brownies? Have Mercy! These look super great. I am speechless – WOW! 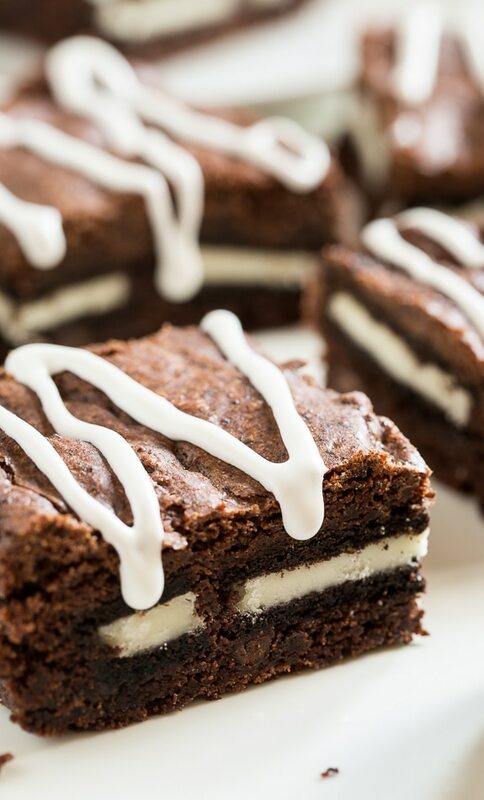 That texture – that melty frosting – those OREOS!!!! Oreos are very much loved in our house too and these would not be safe near us! Those runners must have been delighted to see these!